Air conditioning comes standard on almost every car sold in the U.S. today. Even if you are driving around sweating in a sweltering hot car, it is usually not because the vehicle doesn’t have A/C; it’s because the A/C it has is broken. Yet for much of the history of the automobile, air conditioning was either a cutting-edge luxury or a sci-fi writer’s dream. The automotive air conditioners of today are the result of a century’s worth of invention and refinement. To give an idea of where we’ve come from, here’s a look back at the history and science of keeping cool in cars. 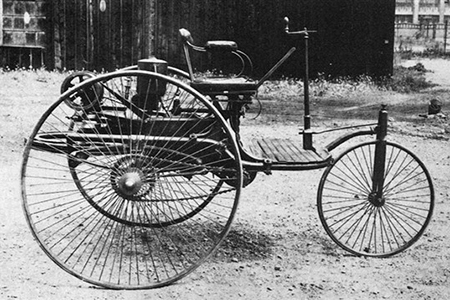 1886 – The first patent for a production automobile is issued. The vehicle lacks many things you’d expect on a car today: it has no windshield, roof, doors, steering wheel, gas pedal, or brake pedal, and has only three wheels. Needless to say, it also has no A/C. 1903 – A Packard Model F nicknamed “Old Pacific” becomes only the second car to drive coast-to-coast (a two-month trip at that time). Though cars still lack any kind of enclosed cabin, the driver set up a large umbrella to provide shade and make hot desert crossings at least a little cooler. 1919 – The Kool Kooshion seat cover uses small springs to hold drivers about a half-inch above the car seat, allowing air to circulate underneath them and behind their backs. It basically allows the sweat on your back to evaporate and help keep you cool. The Kool Kooshion is actually still sold today at major retailers. 1921 – The Knapp Limo-Sedan Fan is a small electric fan that can be added to the inside of a car (since most cars are now enclosed). Such fans still don’t cool the air, though; they just create a breeze and help evaporate sweat. 1930 – The “car cooler” uses the evaporation of water (rather than your own sweat) to cool air, which is then blown in through the open passenger-side window. Though it’s the first item to actually lower the air temperature, it only works in areas with very low humidity—and, it looks like you have a vacuum cleaner strapped to the side of your car. Thermador Car Cooler. Photo Source. 1939 – Packard becomes the first car manufacturer to offer air conditioning as an option. The cooling system is located in the trunk, rather than in the dash, and you have to manually install or remove the drive belt from the A/C compressor to turn the system on or off. The option costs $274 at a time when the average yearly income is $1,368. That, plus the start of World War II, causes the option to be short-lived. 1953 – Eight years after the end of the war, A/C finally returns to the automotive industry. Several manufacturers offer A/C as an option, all of them being rear-mounted systems not much different from what Packard used in 1939. 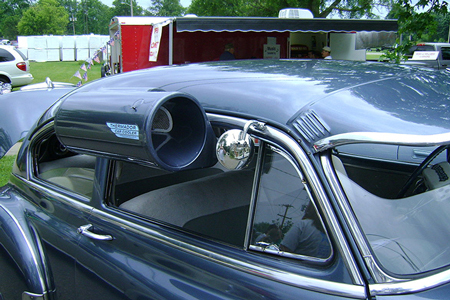 1953 Chrysler Imperial with factory trunk mounted “Airtemp” system. Photo Source. 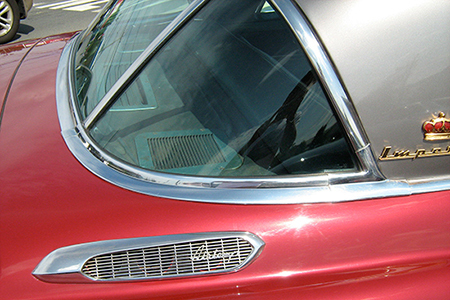 1954 – Pontiac and Nash become the first two companies to fit the A/C system in the front of their cars, instead of in the trunk. The Nash system combines the heater and air conditioner into one in-dash system, establishing the standard that most all cars have followed since. 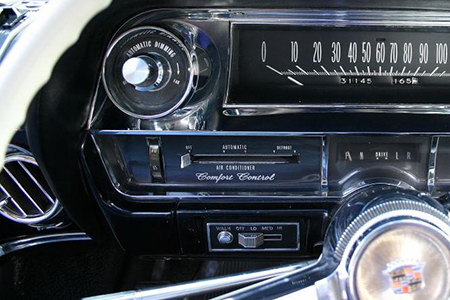 1964 – Cadillac introduces Comfort Control. For the first time, drivers can set a preferred temperature, and the system will automatically adjust the A/C or heater output to keep the car interior at that temperature. 1964 Cadillac series 62 six window sedan. Photo Source. 1968 – The AMC Ambassador becomes the first car to include A/C as standard equipment, rather than an added option. 1969 – Over half of all American cars now have A/C. 1970 – Interdynamics (IDQ) is founded and creates the first do-it-yourself automotive A/C kits. 1987 – Due to concerns about depletion of the ozone layer, the Montreal Protocol is signed, providing a plan for the phase-out of the R-12 refrigerant used in most A/C systems. 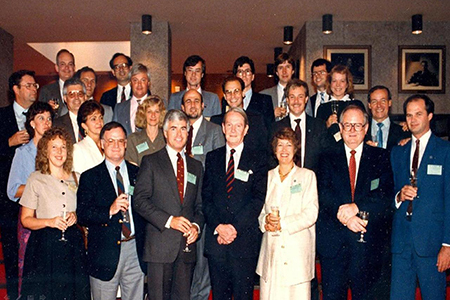 Members of the Canadian delegation at the historic 1987 signing. Photo Source. 1994 – All new automotive A/C systems are required to run on R-134a refrigerant, rather than R-12. 2003 – IDQ launches all-in-one DIY solutions for repairing auto A/C systems. A single can recharges the system with R-134a, seals leaks, eliminates corrosive moisture, and replaces lost lubricant—all in about 10 minutes, with no special tools required. Today – Though there are discussions about potential new refrigerants that could be used in the future, car A/C systems have stayed mostly the same over the past two decades. More than a million people have used our all-in-one recharge kits to repair their auto A/C systems, collectively saving hundreds of millions of dollars. 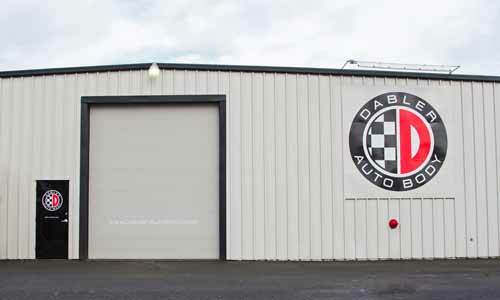 This entry was tagged A/C, air conditioning, ASE Certified, auto, auto body, automotive, body, frame, I-Car, I-CAR Gold Class, lifetime warranty, oregon, paint-less dent removal, repair, Salem. Bookmark the permalink.